Indonesia’s Minister of Trade, Mr. Thomas Lembong stressed the importance of public process and communications to explain the benefits of trade to “men and women on the street” in very simple terms without which there will not be public support for regional economic integration. 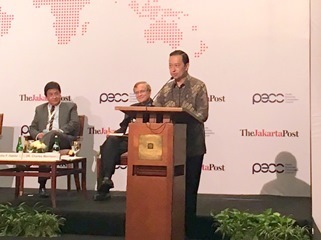 He was speaking at the concluding panel discussion on the opportunities and challenges for regionalism in view of AEC, RCEP, and the TPP during a conference co-organized by the Pacific Economic Cooperation Council (PECC) and the Jakarta Post on 25th April. ASEAN Secretary-General Mr. Le Luong Minh said in his keynote speech, “With the establishment of ASEAN Community last year, ASEAN, through its Vision 2025, has embarked on a new phase focused on consolidating gains from last fifty years’ work, addressing the existing and emerging challenges of the next decade.” He said that the ASEAN Vision 2025 was also complementary to the United Nations 2030 Agenda for Sustainable Development. Mr. Jusuf Wanandi, Publisher of the Jakarta Post and former Co-Chair of PECC, said that the PECC-Jakarta Post conference on April 25th was designed to convene thought leaders from the region’s prominent business and media entities including chief editors to consider these challenges and the roles they need to play in the new environment. “We have organized this conference, ‘Global Challenges and Regional Solutions: Engaging stakeholders’ in Jakarta to think about what comes next after the launch of AEC and the conclusion of TPP negotiations,” he added. Following up from the inaugural seminar on Managing the Blue Economy international project held in Papeete, French Polynesia, the second seminar focusing on ports and sustainability was held in Busan, Korea in partnership with the Korea Maritime Institute (KMI). The project is undertaken against the backdrop of a considerable shift in the shipping industry, which, after years of growth, is experiencing stagnant trade volumes, and in awareness of global environmental issues, accelerating efforts to enhance environmental-friendly productivity and beautification. The seminar addressed environmental challenges and risks such as climate change concerns and pollution at ports. It also looked at economic challenges in light of increasing size in vessels which necessitate upgrading or relocation of ports, pollution at ports and sea, best practices in increasing energy efficiency at ports and ships while keeping them green. This project consisting of a series of three seminars in different PECC locations over 2015-2016 is led by the France (Pacific Territories) Committee for PECC (FPTPEC) and other member committees of PECC. The concluding seminar is scheduled to take place in Auckland, New Zealand on December 5-6, 2016, hosted by NZPECC. Under the joint sponsorship of Ministry of Commerce of China, Tianjin Municipal Government, and China National Committee for Pacific Economic Cooperation (CNCPEC), 12th PECC International Trade and Investment Fair & 6th Forum on Chinese Enterprises Going Global Strategy was held in Tianjin, China, from 14th to 15th April 2016. Amb. 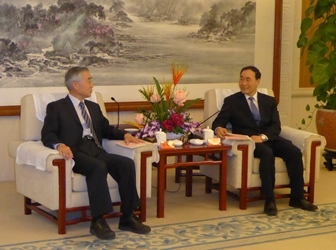 Tang Guoqiang, Co-Chair of PECC and Chair of CNCPEC, and Mr. Zhao Haishan, Vice Mayor of Tianjin City, attended the opening event and made keynote addresses. In his address, Amb. Tang Guoqiang mentioned the efforts and contributions made by PECC and CNCPEC over the years to promote macroeconomic studies, policy coordination and people-to-people exchanges within the Asia-Pacific region, and reaffirmed the commitment of PECC and CNCPEC to working together with related parties to explore new paths for regional sustainable development and Asia-Pacific economic integration. 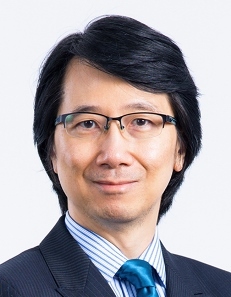 Professor Matthew Kwok On Lee has been appointed as the new Chair for HKCPEC as of April 1, 2016. He is Vice-President (Development and External Relations) of City University of Hong Kong (CityU). He holds a tenured position as Chair Professor of Information Systems & E-commerce at the University. He was Associate Dean (2001-2006, 2007-2011) and Acting Dean (2006-2007) of the College of Business at the City University and is the founding director of the CityU Doctor of Business Administration (DBA) Program. 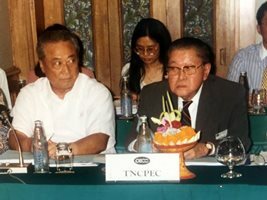 The Pacific Economic Cooperation Council mourns the loss of Tun Thanat Khoman who passed away in Bangkok on March 3rd, 2016 at the age of 102. He was the last surviving "founding father" of ASEAN as well as a founder of PECC. Tun Thanat Khoman was the foreign minister of Thailand from 1959 to 1971 during which time he played an instrumental role in mediating between Indonesia and Malaysia, paving the way for the establishment of ASEAN in 1967. The ASEAN Declaration was signed in Bangkok by the foreign ministers Adam Malik of Indonesia, Narciso R Ramos of the Philippines, Tun Abdul Razak of Malaysia, S Rajaratnam of Singapore and Thanat Khoman of Thailand. Beyond ASEAN, noting the increasing interdependence among the Asia-Pacific economies, he actively advocated strengthening regional cooperation in the Pacific. The creator of the winning one-minute mobile video submission will be awarded a trip to Lima, Peru to meet with CEOs at the APEC CEO Summit on 17-19 November and their video will be screened during APEC Economic Leaders’ Week. To participate in the APEC Video Contest, visit www.apec.org/Videocontest2016.aspx. Submissions close on 15 July 2016, 23:59 Singapore time.